Patience and low temperatures are the keys to making delectable, oven-cooked brisket. In its original condition, it's as tough and chewy as a slab of old leather, yet when properly cooked, it's tender and delicious. Getting your piece of brisket from one stage to the other requires slow, careful cooking. That can take place in a barbecue or a countertop slow cooker, but your oven works just as well. Either slow-roasting or oven braising can produce a tender and richly flavored brisket. Trim any excess fat from the surface of your brisket with a sharp knife, leaving approximately 1/4 inch to protect the meat from drying in your oven. If you wish to add flavor to the beef, rub its surface with a seasoning paste or dry spice rub and leave it in your refrigerator overnight. Scatter coarsely chopped onion, carrot and celery over the bottom of a roasting pan or large baking dish. Place the brisket on top of the vegetables, which will act as a natural roasting rack and also add flavor to the drippings. Pour in enough water to barely cover the bottom of the pan. Cover the pan with its lid, or a sheet of heavy-duty aluminum foil. Slide it onto the middle rack of a 250-degree Fahrenheit oven. Cook the brisket, well covered with foil, until it's tender enough that you can easily slide the tines of a fork into the meat and twist off a mouthful. Depending on the size and thickness of your piece of brisket, that might take as little as 3 to 4 hours, or as long as 8 hours. Cover the brisket loosely with aluminum foil and let it rest for 15 to 20 minutes before slicing and serving it. Remove most of the fat from the brisket's surface with a sharp knife, leaving no more than 1/4 inch to hold the brisket together once it's cooked. Layer the bottom of a deep casserole dish or Dutch oven with coarsely chopped onions, carrots and celery. Add a bay leaf or other flavoring ingredients as desired, then lay the brisket on top of the vegetables. Season it lightly with salt and pepper. Pour in enough water or beef broth to immerse the bottom half of the brisket. Cover the pan tightly, with either its own lid or a sheet of heavy-duty aluminum foil. Bake the brisket in a preheated oven at 300 F for 4 to 6 hours, turning it every 90 minutes so each side is immersed in the cooking liquid approximately half of the time. It's done when you can easily slide a fork or the tip of a paring knife into the meat. Remove your brisket from the cooking liquids, and let it rest on a serving tray under a loose covering of foil. Strain the cooking liquids and skim away any fat, then thicken and season them to make a sauce for your brisket. Serve meat and sauce together with your favorite side dishes. 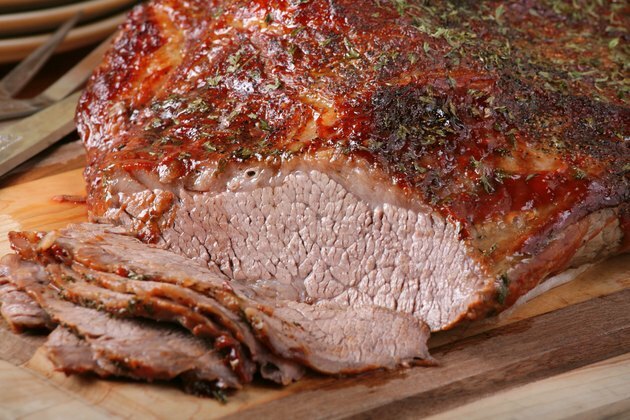 Brisket cooked by either method can be prepared ahead of time and refrigerated, which firms up the texture of the meat and gives better slices. Reheat the meat gently for a hot meal, or slice it cold for sandwiches. Water and beef broth are the most common cooking liquids for braised brisket, but any liquid with a complementary flavor is appropriate. Many cooks use wine or dark beer, diluted barbecue sauce or even tomatoes in their own juice.